Godalming Borough Hall Ceilidhs have been going since 1976. The raison d’etre has always been to book the best and most exciting English folk dance bands and dance callers from all over the country. Experts and newcomers are all welcome, the emphasis is on fun and enthusiasm. 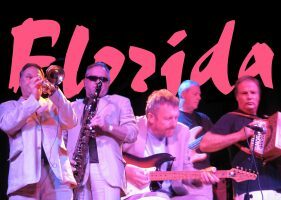 The band tonight will be Florida, with caller Chris Rose, from Kent – English ceilidh music with a punchy brass section. Tickets £12 on the door or £11 in advance (£6 for children).